Stuart Appleby and Aaron Baddeley are the only Australian players to make weekend cut for the PGA event on St Simons Island. 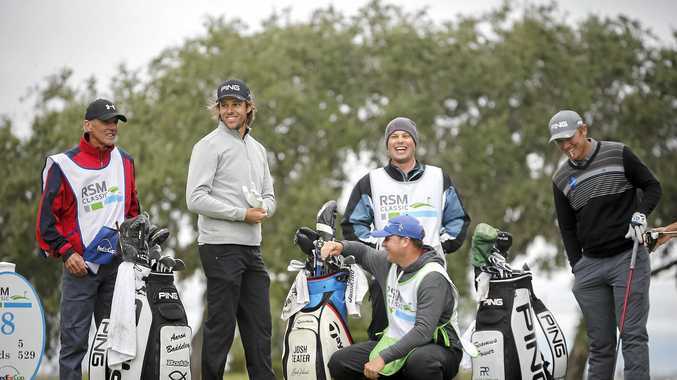 But the former Australian Open winners have plenty of work to do, finding themselves a long way off the leaders after the second round of the RSM Classic. Appleby shot a two-under par 70 on the Plantation course while Baddeley struggled on the Seaside layout with a two-over par 72. They are in a share of 49th, 11 shots behind the halfway leader Charles Howell III. Howell is playing some of his best golf when he least expected it. Coming from a missed cut in Mexico to a tournament where he missed the cut last year, the American kept bogeys off his card for the second straight day and was just as good Friday on the tougher scoring course at Sea Island. He had a six-under 64 on the Seaside course and matched the best 36-hole score of his career to build a three-shot lead. "You just never know what's around the corner in this game," Howell said.